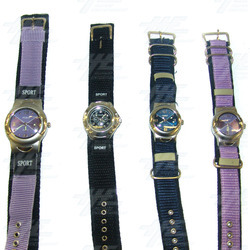 An assortment of fabric sports watches in a variety of styles and designs. This bulk offer includes gender specific designs as well as unisex models. The majority of these watches have analogue displays. PLEASE NOTE: watches will not come with new/replacement batteries. Most watches have expired batteries.